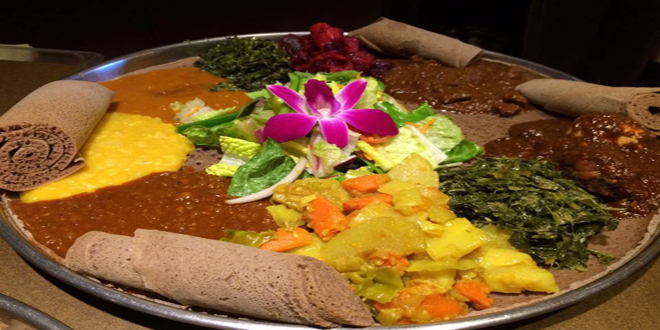 Addissae, Asheville’s only restaurant offering Ethiopian cuisine was just awarded recognition by NC GreenTravel Initiatives as North Carolina’s newest sustainable destination. Opened late in 2014, Addissae took over the space downtown once occupied by Firestorm Books on Commerce Street, behind The Thirsty Monk. A year after opening, the restaurant fell on hard times and owners Vicki Schomer and Neeraj Kebede launched a GoFundMe campaign to cover expenses as they struggled to stay afloat. Their efforts were successful, and Addissae has continued to flourish, and developed a loyal customer based. Now recognized as a GreenTravel Business with the state of North Carolina, Addissae joins the ranks of other GreenTravel local eateries, including Curate, Tupelo Honey, Corner Kitchen, HomeGrown, and The Bistro at Biltmore Estate. The NC Green Travel Program aims to make North Carolina’s tourism business more profitable through environmental sustainability. North Carolina’s green travel recognition program is the most extensive in the nation, encompassing lodging, food service, attractions, museums, parks, vacation rentals, convention centers, festivals and other travel-oriented businesses. The actions encouraged by NC GreenTravel help businesses reduce operation costs, increase profits and extend their brand to a growing consumer market making travel decisions based upon the green practices of those from whom they purchase. The NC GreenTravel Initiative is a free program to help promote robust economic growth and environmental stewardship in the travel and hospitality sector through the recognition of “green” travel-oriented businesses.